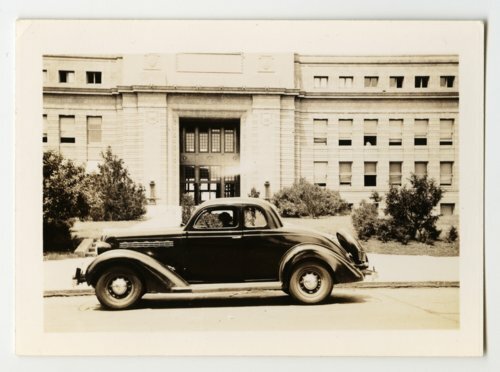 This is a photograph showing an automobile parked in front of Strong Hall at the University of Kansas in Lawrence, Kansas. Clarence and Janice Fornwald took the photograph while they were on their honeymoon. They started from Pittsburg, California and travelled through Utah, Kansas, Wyoming, Colorado, Pennsylvania, Washington, D.C., New York, New England, and eventually to Quebec, Canada.